The Director of Product Management is responsible for product planning and executing all through the business lifecycle. 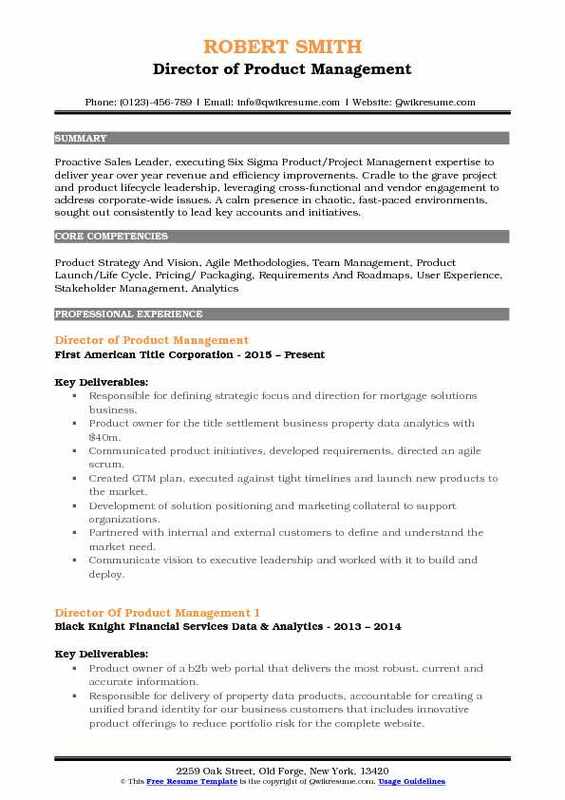 As this role is a cross-functional job, the director of product management job template comprises of a variety of tasks including – managing product management team, collaborating with other departments such as marketing, sales, designing and so on; reviewing product proposals received from junior managers, keeping stakeholders up-to-date of product progress, providing strategic planning, suggesting new product feature, and researching on similar product at the marketplace. 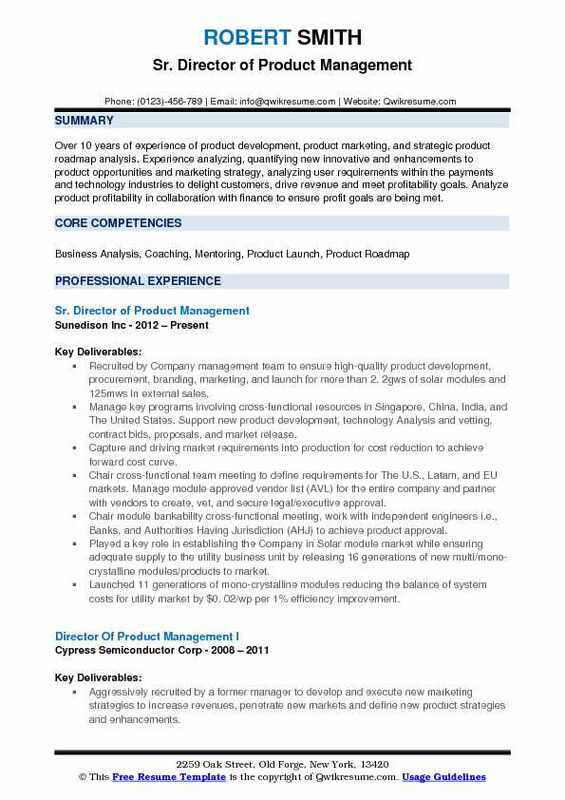 A well-drafted Director of Product Management Resume mentions associated attributes such as product management process experience, a proven track record of product planning, and product launches, proficiency in MS Office and other analytical tools, entrepreneurial skills, up-to-date field knowledge and team building competencies. 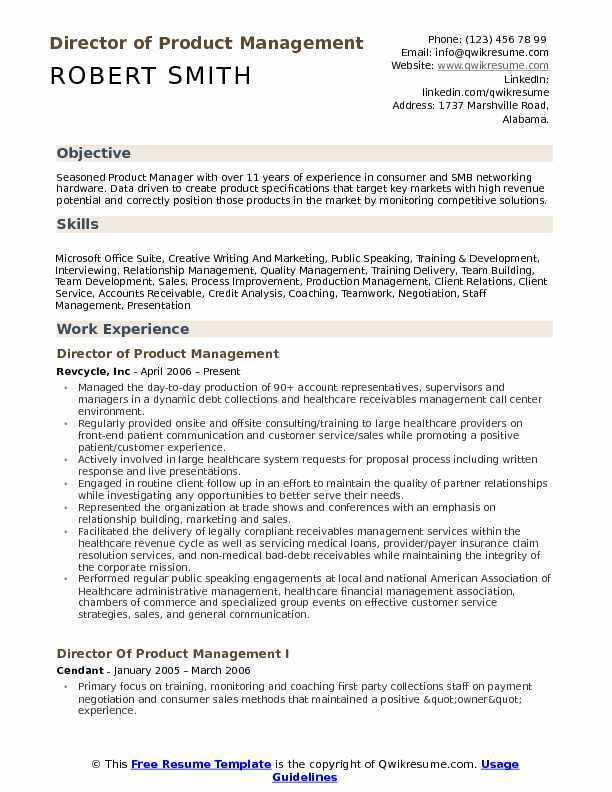 A successful resume mentions a Post graduation in business administration. 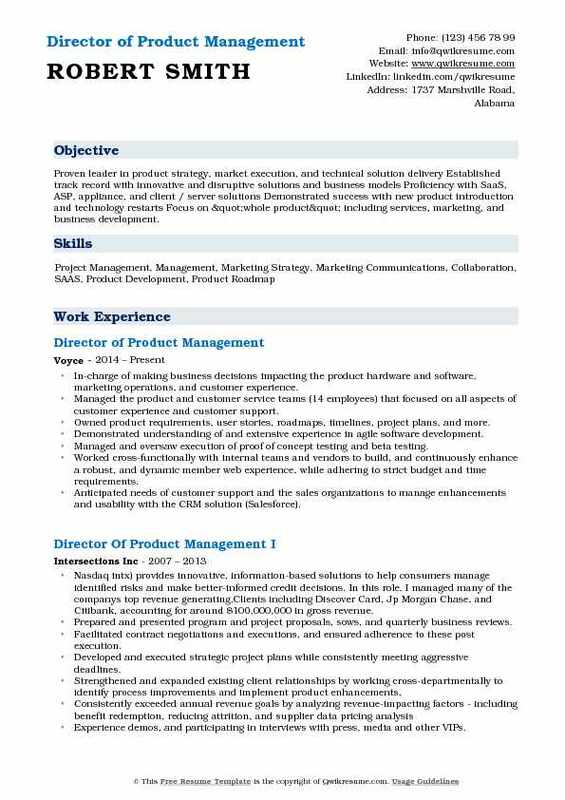 Summary : Seasoned Product Manager with over 11 years of experience in consumer and SMB networking hardware. Data driven to create product specifications that target key markets with high revenue potential and correctly position those products in the market by monitoring competitive solutions. Managed the day-to-day production of 90+ account representatives, supervisors and managers in a dynamic debt collections and healthcare receivables management call center environment. Regularly provided onsite and offsite consulting/training to large healthcare providers on front-end patient communication and customer service/sales while promoting a positive patient/customer experience. Actively involved in large healthcare system requests for proposal process including written response and live presentations. Engaged in routine client follow up in an effort to maintain the quality of partner relationships while investigating any opportunities to better serve their needs. Represented the organization at trade shows and conferences with an emphasis on relationship building, marketing and sales. Facilitated the delivery of legally compliant receivables management services within the healthcare revenue cycle as well as servicing medical loans, provider/payer insurance claim resolution services, and non-medical bad-debt receivables while maintaining the integrity of the corporate mission. Performed regular public speaking engagements at local and national American Association of Healthcare administrative management, healthcare financial management association, chambers of commerce and specialized group events on effective customer service strategies, sales, and general communication. Communication liaison between information technology/systems and production departments, translating the needs of one area into practical and actionable items for the other. Partnered with internal business planning, sales, and workforce management leaders to optimize staffing levels across multiple sites to meet business objectives and ensure high-quality customer service experience defined by key performance indicators. Summary : Over 10 years of experience of product development, product marketing, and strategic product roadmap analysis. Experience analyzing, quantifying new innovative and enhancements to product opportunities and marketing strategy, analyzing user requirements within the payments and technology industries to delight customers, drive revenue and meet profitability goals. Analyze product profitability in collaboration with finance to ensure profit goals are being met. Recruited by Company management team to ensure high-quality product development, procurement, branding, marketing, and launch for more than 2. 2gws of solar modules and 125mws in external sales. Manage key programs involving cross-functional resources in Singapore, China, India, and The United States. Support new product development, technology Analysis and vetting, contract bids, proposals, and market release. Capture and driving market requirements into production for cost reduction to achieve forward cost curve. Chair cross-functional team meeting to define requirements for The U.S., Latam, and EU markets. Manage module approved vendor list (AVL) for the entire company and partner with vendors to create, vet, and secure legal/executive approval. Chair module bankability cross-functional meeting, work with independent engineers i.e., Banks, and Authorities Having Jurisdiction (AHJ) to achieve product approval. Played a key role in establishing the Company in Solar module market while ensuring adequate supply to the utility business unit by releasing 16 generations of new multi/mono-crystalline modules/products to market. Launched 11 generations of mono-crystalline modules reducing the balance of system costs for utility market by $0. 02/wp per 1% efficiency improvement. Developed and led go-to-market and product change notification process, ensuring full product ecosystem and vendor compliance with bankability standards, for all product generations. Gained $0. 01/wp forward cost curve reduction by partnering with five tier 1 suppliers worldwide to support tracker short rails. A program managed this complex effort to align all five suppliers with key specifications. 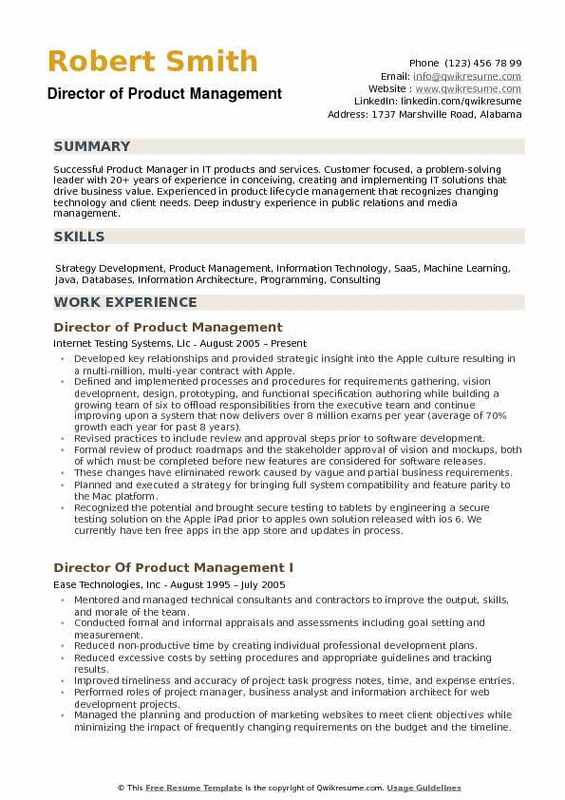 Summary : Product leader with more than 15 years of Product Management experience in software and hardware across multiple industries. Focused on efficiently releasing quality products based on market research, analytics and business financial goals. Skills : Numerous Tools And Platforms Related To Product, Customer, And Market Analysis. Led product and business strategy for embedded OEM software components licensed to leading software application providers including Google, IBM, Microsoft, Symantec, Thomson Reuters and others. Oversaw inbound and outbound product management including requirements gathering, product planning, go-to-market, marketing communications, sales support and license contract negotiation. Led joint sales, engineering, and product management meetings with customers to share roadmaps, identify new requirements and ensure alignment. Developed annual product business plan which demonstrated alignment with market trends and overall division strategy. Monitored existing and emerging markets to anticipate longer-term opportunities and align roadmap. Developed a business plan for and proposed a hosted software service to broaden distribution and align with the company’s cloud strategy. Established continuous feedback through a “voice of the customer” program which guided product development and enhanced customer communication. Designed and implemented a multi-year requirements survey and gap analysis which improved product development focus. Oversaw the development and execution of competitive interviews which provided new differentiation points. 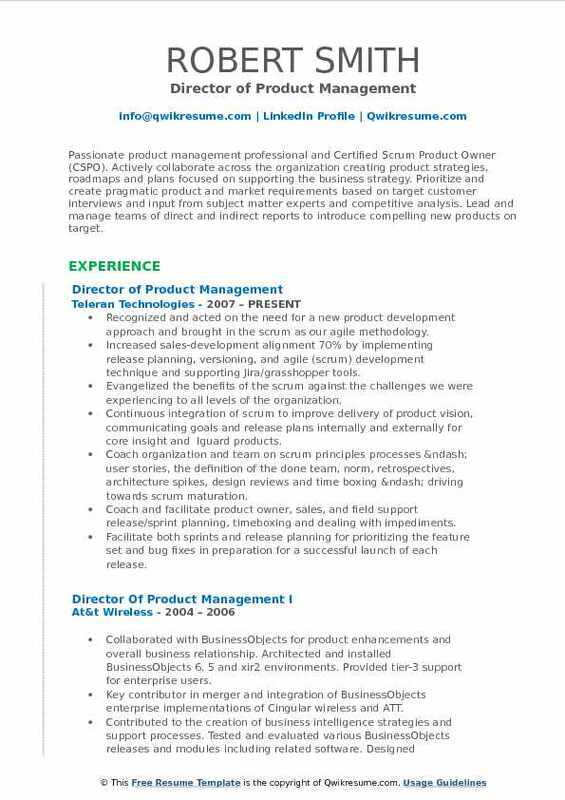 Summary : Passionate product management professional and Certified Scrum Product Owner (CSPO). Actively collaborate across the organization creating product strategies, roadmaps and plans focused on supporting the business strategy. Prioritize and create pragmatic product and market requirements based on target customer interviews and input from subject matter experts and competitive analysis. Lead and manage teams of direct and indirect reports to introduce compelling new products on target. Recognized and acted on the need for a new product development approach and brought in the scrum as our agile methodology. Increased sales-development alignment 70% by implementing release planning, versioning, and agile (scrum) development technique and supporting Jira/grasshopper tools. Evangelized the benefits of the scrum against the challenges we were experiencing to all levels of the organization. Continuous integration of scrum to improve delivery of product vision, communicating goals and release plans internally and externally for core insight and Iguard products. Coach organization and team on scrum principles processes – user stories, the definition of the done team, norm, retrospectives, architecture spikes, design reviews and time boxing – driving towards scrum maturation. Coach and facilitate product owner, sales, and field support release/sprint planning, timeboxing and dealing with impediments. Facilitate both sprints and release planning for prioritizing the feature set and bug fixes in preparation for a successful launch of each release. Ensure delivery of product vision communicating goals and release plans internally and externally. Prioritized the feature set in preparation for a successful launch of each release. Establish a foundation of understanding for data protection, data analytics, and data management applications in the data center. Manage 3 direct reports. Drove sales 100% and reduced customer churn 25% by developing cross-database platform actionable data warehouse management dashboards. Increased sales opportunities 400% by developing solutions for migrating to and on-going optimization for Exadata. Delivered a key IBM db2 and SAP reference as a result of customs compliance solution developed for the European government that generated 50% of overall company quarterly revenue. 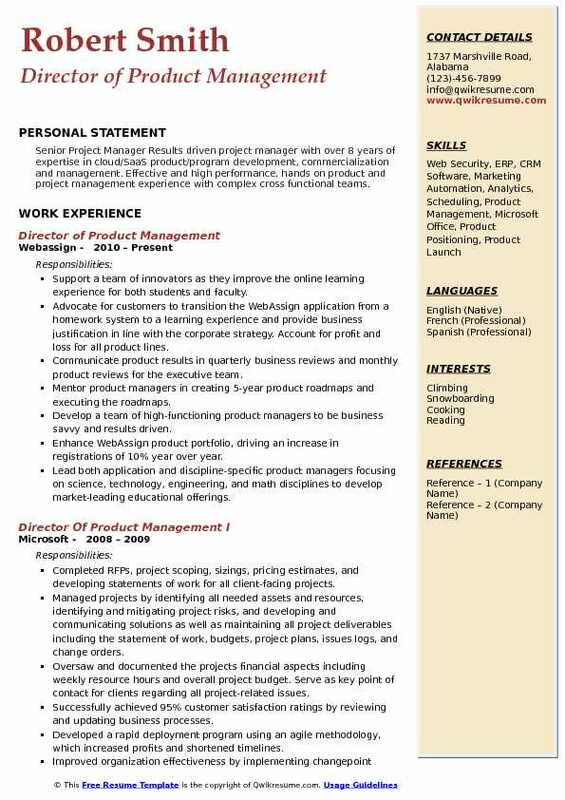 Summary : Executive product and technology manager with a solid track record of defining, enhancing and driving the product and technology roadmap for online customer-facing applications and internal business tools. Expert at visioning solutions, gathering stakeholder support, defining and measuring product KPIs, and implementing Agile software development processes for improved workflow efficiencies. 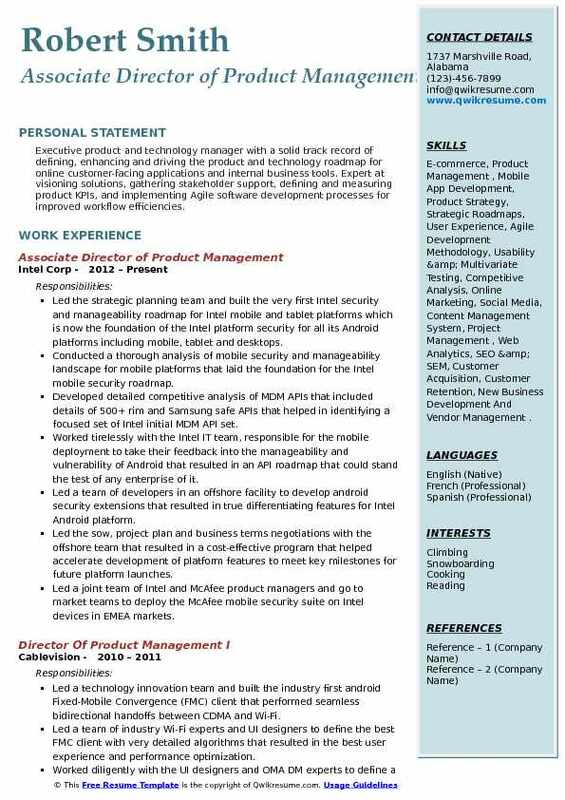 Skills : E-commerce, Product Management , Mobile App Development, Product Strategy, Strategic Roadmaps, User Experience, Agile Development Methodology, Usability & Multivariate Testing, Competitive Analysis, Online Marketing, Social Media, Content Management System, Project Management , Web Analytics, SEO & SEM, Customer Acquisition, Customer Retention, New Business Development And Vendor Management . Led the strategic planning team and built the very first Intel security and manageability roadmap for Intel mobile and tablet platforms which is now the foundation of the Intel platform security for all its Android platforms including mobile, tablet and desktops. Conducted a thorough analysis of mobile security and manageability landscape for mobile platforms that laid the foundation for the Intel mobile security roadmap. Developed detailed competitive analysis of MDM APIs that included details of 500+ rim and Samsung safe APIs that helped in identifying a focused set of Intel initial MDM API set. Worked tirelessly with the Intel IT team, responsible for the mobile deployment to take their feedback into the manageability and vulnerability of Android that resulted in an API roadmap that could stand the test of any enterprise of it. Led a team of developers in an offshore facility to develop android security extensions that resulted in true differentiating features for Intel Android platform. Led the sow, project plan and business terms negotiations with the offshore team that resulted in a cost-effective program that helped accelerate development of platform features to meet key milestones for future platform launches. Led a joint team of Intel and McAfee product managers and go to market teams to deploy the McAfee mobile security suite on Intel devices in EMEA markets. Worked in joint Intel-McAfee technology team that resulted in the definition of innovative and differentiating solutions for the Intel-McAfee mobile platform. Worked as an extended member of the McAfee MMS team and provided feature suggestions for the MMS product thus making an impact on the enhancing of the McAfee MMS roadmap. Summary : Proven leader in product strategy, market execution, and technical solution delivery Established track record with innovative and disruptive solutions and business models Proficiency with SaaS, ASP, appliance, and client / server solutions Demonstrated success with new product introduction and technology restarts Focus on "whole product" including services, marketing, and business development. In-charge of making business decisions impacting the product hardware and software, marketing operations, and customer experience. Managed the product and customer service teams (14 employees) that focused on all aspects of customer experience and customer support. Owned product requirements, user stories, roadmaps, timelines, project plans, and more. Demonstrated understanding of and extensive experience in agile software development. Managed and oversaw execution of proof of concept testing and beta testing. Worked cross-functionally with internal teams and vendors to build, and continuously enhance a robust, and dynamic member web experience, while adhering to strict budget and time requirements. Anticipated needs of customer support and the sales organizations to manage enhancements and usability with the CRM solution (Salesforce). Developed and continuously reviewed member feedback and engagement reports and analytics to drive. Supported the business development, marketing, and public relations teams by providing members. Objective : Driven results-oriented product management executive with proven ability to successfully capitalize on emerging market trends at large and small companies. Accomplished at leading product planning, bringing new products to market, revamping product management organizations, and driving rapid revenue growth through sales and buyer-centric approaches. Extensive experience in Product Management, Product Marketing, Product Launch. Manage the backlog of requirements for the telephony portfolio and the roadmap for all future requirements. Document and analyze all business/technical requirements/user stories for the delivery of the telephony contact center tools project. Responsible for managing a relationship with Cisco/CDW/Verint/e-gain implementation vendors in order to stay abreast of product knowledge. Evaluate the bill of materials provided by Cisco for the Cisco unified contact center enterprise phone system. 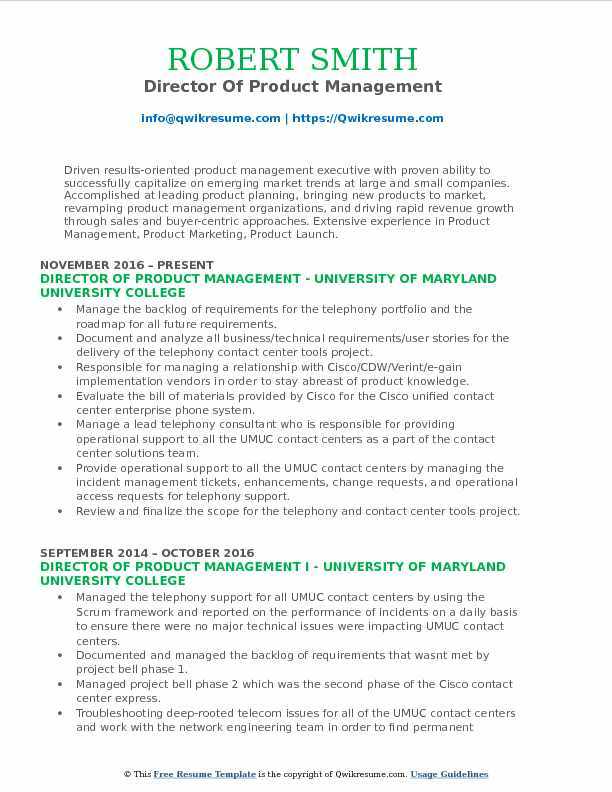 Manage a lead telephony consultant who is responsible for providing operational support to all the UMUC contact centers as a part of the contact center solutions team. Provide operational support to all the UMUC contact centers by managing the incident management tickets, enhancements, change requests, and operational access requests for telephony support. Review and finalize the scope for the telephony and contact center tools project. Assisted with the negotiation of 4 separate statement of work contracts that totaled 4 million dollars for the telephony and contact center tools program. Create an operational support model using scrum methodology for all telephony support systems in order to ensure there was a clear understanding of roles/responsibilities between all it support teams. Objective : Proactive Sales Leader, executing Six Sigma Product/Project Management expertise to deliver year over year revenue and efficiency improvements. Cradle to the grave project and product lifecycle leadership, leveraging cross-functional and vendor engagement to address corporate-wide issues. A calm presence in chaotic, fast-paced environments, sought out consistently to lead key accounts and initiatives. Responsible for defining strategic focus and direction for mortgage solutions business. Product owner for the title settlement business property data analytics with $40m. Communicated product initiatives, developed requirements, directed an agile scrum. Created GTM plan, executed against tight timelines and launch new products to the market. Development of solution positioning and marketing collateral to support organizations. Partnered with internal and external customers to define and understand the market need. Communicate vision to executive leadership and worked with it to build and deploy. Product champion with outside in customer focus approach to product development and prioritization. Created project approval spend forms and presented ideas to executive leadership for approval and funding. 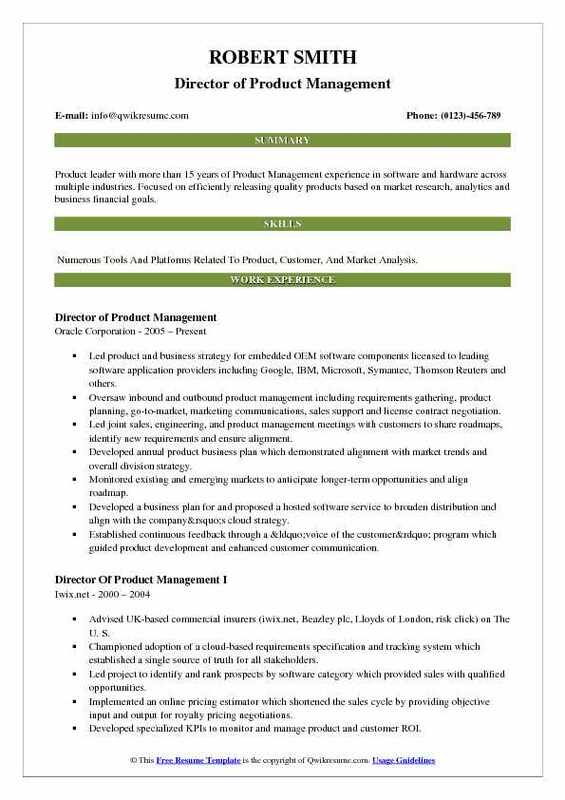 Summary : Senior Project Manager Results driven project manager with over 8 years of expertise in cloud/SaaS product/program development, commercialization and management. Effective and high performance, hands on product and project management experience with complex cross functional teams. Support a team of innovators as they improve the online learning experience for both students and faculty. Advocate for customers to transition the WebAssign application from a homework system to a learning experience and provide business justification in line with the corporate strategy. Account for profit and loss for all product lines. Communicate product results in quarterly business reviews and monthly product reviews for the executive team. Mentor product managers in creating 5-year product roadmaps and executing the roadmaps. Develop a team of high-functioning product managers to be business savvy and results driven. Enhance WebAssign product portfolio, driving an increase in registrations of 10% year over year. Lead both application and discipline-specific product managers focusing on science, technology, engineering, and math disciplines to develop market-leading educational offerings. Collaborate with cross-functional teams to improve product quality and help students learn using direct customer feedback. Gather and analyze data from multiple sources to develop customer-focused product plans. Summary : Successful Product Manager in IT products and services. Customer focused, a problem-solving leader with 20+ years of experience in conceiving, creating and implementing IT solutions that drive business value. Experienced in product lifecycle management that recognizes changing technology and client needs. Deep industry experience in public relations and media management. Developed key relationships and provided strategic insight into the Apple culture resulting in a multi-million, multi-year contract with Apple. Defined and implemented processes and procedures for requirements gathering, vision development, design, prototyping, and functional specification authoring while building a growing team of six to offload responsibilities from the executive team and continue improving upon a system that now delivers over 8 million exams per year (average of 70% growth each year for past 8 years). Revised practices to include review and approval steps prior to software development. Formal review of product roadmaps and the stakeholder approval of vision and mockups, both of which must be completed before new features are considered for software releases. These changes have eliminated rework caused by vague and partial business requirements. Planned and executed a strategy for bringing full system compatibility and feature parity to the Mac platform. Recognized the potential and brought secure testing to tablets by engineering a secure testing solution on the Apple iPad prior to apples own solution released with ios 6. We currently have ten free apps in the app store and updates in process. Generated for developing the apps, our apps efficiency: created a vision for a digital dashboard and led the implementation of a dynamic reporting.